New startup Cobo allows San Franciscans to rent out their homes as offices. San Francisco government is not amused. These fliers have the homespun, photocopied Sharpie-on-typing paper look of something you’d get from a local kid offering to walk your dog or the church group that wants your gently used jackets. It’s not anything like that. Rather, it’s a note from Cobo, a nascent startup hoping to capitalize on what its founder calls “a billion-dollar market”: Placing lonely freelancers pining for company into people’s homes, monetizing that home, and taking a cut. When Cobo mailed out fliers to residents of the Mission, Cole Valley, and elsewhere in order to find freelancers willing to pay $10 a day or more to work in strangers’ kitchens and strangers willing to host them — it managed to inadvertently solicit several employees of the San Francisco Planning Department at their homes. These employees then brought the fliers to Tina Tam, the Planning Department’s code enforcement manager. She roped in the department’s Zoning Administrator to decide whether Cobo’s business model is strictly legal. The City Attorney is now in the loop, too. Our planning codes were not prescient enough to directly rule on whether you can glean money from people via a third-party outfit by running a de-facto office out of your home. But it is pretty clear that, with specific exceptions, you cannot run an office out of your home, and cannot have employees or clients dropping by. So, planners are involved, lawyers are involved, and lawyers with an expertise in planning are involved. It remains to be seen how they’ll rule on the legality of Cobo’s business model on the eve of its official San Francisco launch. But, having made a number of phone calls to city decisionmakers, one needn’t be an expert to intuit that they do not appreciate learning of a company’s official launch via haphazard and inadvertent mass-mailings. It would not at all be at all surprising if our city’s ambiguous rules are interpreted in such a way as to clip this company’s wings. It’s funny, but not ha-ha funny, that the two tech startups-turned-titans that currently epitomize San Francisco — Uber and Airbnb — vastly increased congestion in one of the nation’s most congested cities and cannibalized affordable housing in one of the nation’s most unaffordable cities. Their business models were, additionally, strictly illegal under city law. And yet they flourished here regardless, not because of some newfangled technological ingeniousness but good old-fashioned co-opting of politicians and institutions via money. If you or your principal investors aren’t tight with politicians or regulators, and you can’t induce them to look the other way or rewrite the law so as to enable your company (and, in a neat two-for, kneecap your competitors), then entitled and destructive behavior is less likely to be tolerated. So, no, Cobo has not yet taken the step of registering its business in San Francisco under either the name “Cobo” or its prior iteration, “Hiven.” If and when it starts up here, the hosts of Cobo workspaces would be legally mandated to register as well. As would, additionally, any business operator toiling out of a Cobo workspace (or, for that matter, a cafe, or her own home, or anywhere within city limits). And, while Cobo disseminated fliers throughout the Mission, it never contacted the neighborhood’s elected representative, Supervisor Hillary Ronen. This is, to put it mildly, not a good way to break the ice with any elected leader, let alone the one overseeing the desired territory of the Mission. Supervisor Hillary Ronen, seen here scouring 16th Street BART Plaza, feels the Mission has enough challenges without homeowners and apartment dwellers being enabled to convert their dwellings into offices. Photo by Susie Neilson. There are, already, services in this city offering similar fare to Cobo. Spacious, for example, allows freelance workers to post up in restaurants during hours when they’d otherwise be closed. City officials told me they found this far less problematic. These restaurants are, naturally, in the districts where the city would prefer businesses to be. And it’s not as if a co-working space will be such a bonanza that a building owner will shutter a restaurant and go full-laptop haven. And yet, Cobo’s website allows for up to six workers to drop by one’s home for up to five days a week. With this income — plus potential short-term rentals on Airbnb or similar sites — the notion of taking a home off the market and converting it into a full-time office/hotel/not-a-home is hardly far-fetched. Just how Cobo plans to ensure unscrupulous people won’t exploit its site is something city officials would have loved to discuss prior to fliers showering the neighborhood. And that model works. Until it doesn’t. Because when you fail to engage with the Mission, the Mission engages with you. Out of business by June. I am ahead of this game. I have a lovely bed in which I sleep 8 hours plus or minus a few at times. Why should this bed be empty the remaining 16 hours. I can get two shifts in there, when I leave for work, somebody else can crawl into a pre-warmed bed. (just swipe your credit card into my reader and you are all set) When that sleeper’s eight hours are up, the next bye-bye beddie can move right in. So a mattress can be used 3 times in a 24 hour cycle. Isn’t that great? That’s my idea of a pop up or a start up or a sleep in. Now I have another idea and that is pre-digested food. Your select your meal from a sustainably selected farm to table menu and it will be eaten and pre-digested for you. Delivered in a stink-proof box, it will come with a complimentary roll of Charmin Tissue on your first order. Why bother eating when somebody else can do it for you. No telling though what reactions will be when those boxes are opened. There is no limit as to what we can with sharing. Husbands, wives, fiances’ all will be hooked up into the new sharing economy. Only in San Francisco ! ! ! ! Any office spaces out there want to provide me a place to live for $10 a day? No? Hmmm… I wonder why. Yes it definitely is alarming to live in a neighborhood where this kind of stuff pops up constantly. So I share Sup. Ronen’s frustration. However an equal if not larger source of frustration for Mission residents and businesses are the bizarre and ever expanding schemes emanating from political power brokers, city departments and our supervisors around land use, planning, quality of life, safe streets, neighborhood amenities, law enforcement. It goes on and on. The latest? That would be a proposal to zone the entire neighborhood from Division and beyond Potrero, to Cesar Chavez and west to Dolores Park a “Latino Cultural District.” Dig into the details and that name is just cover for some pretty frightening corruption and graft, basically the consolidation of land use power to a few who would reap millions and millions of dollars for their so called non profits. It’s like living on a rudderless ship the zig zag and randomness of how our city treats this neighborhood. And yes while leadership is constantly focused on all that, malevolent outsiders come in and lay waste without any fear of consequences. As long as they don’t upset the political apple cart. This does raise legitimate questions about zoning laws, but we shouldn’t fall into seeing Lyft/Uber, AirBnB or Cobo only from a glass-half-empty perspective. Lyft/Uber became popular because they made people happy on both sides of each transaction. Cabs were unpleasant, unreliable and expensive. Students, parents and others with chopped-up schedules had a hard time making rent and car payments. Sure, traffic is worse, but hundreds of thousands of people have seen benefits. AirBnB drives prices up. It also brings tourist dollars – restaurant jobs, retail sales, etc. – and more choice for travelers. With Cobo, people will find affordable places to work during the day (freeing up coffee shop tables), and City residents will find new ways to pay rents and mortgages. Some landlords will take it too far. But don’t throw out the whole idea. I spoke with these folks a couple months ago, and there’s an environmental mission here. Remote workers (and there are more of us every year) don’t have great options. Working at home may not be an option, coffee shops don’t want us, and shared workspaces typically require commutes to downtown office zones. What’s not great about being able to work in your own neighborhood? The founder won her grant from Berkeley because it will reduce commutes by making it easier to work in your own hood. How is someone else’s home a better office than your own? Dumb ideas that make no sense. @Sebra Depends — Do you have children? Do you have other people in your home during the day? Are you in a shared apartment? Do you have reliable wi-fi? Are you good at isolating yourself from household distractions? Interesting idea to explore for some of the reasons mentioned by SEAMUS. Of course in this town the notion that your home is your own is out of style. With myriad groups of activists, busybodies, non-profits, politicians and various city agencies taking a stake in making sure you’re toeing the Calle 24 line. At the end of the last century there were empty storefronts in North Beach. Small scale startups rented these out for cheap office space to get going. Plenty of vacant store fronts in the Mission. Of course inviting small scale tech startups to fill the void and “activate” Mission Street is an unconscionable idea to the existing Latinx power structure who seem convinced Latino culture and technology are antagonistic to each other. 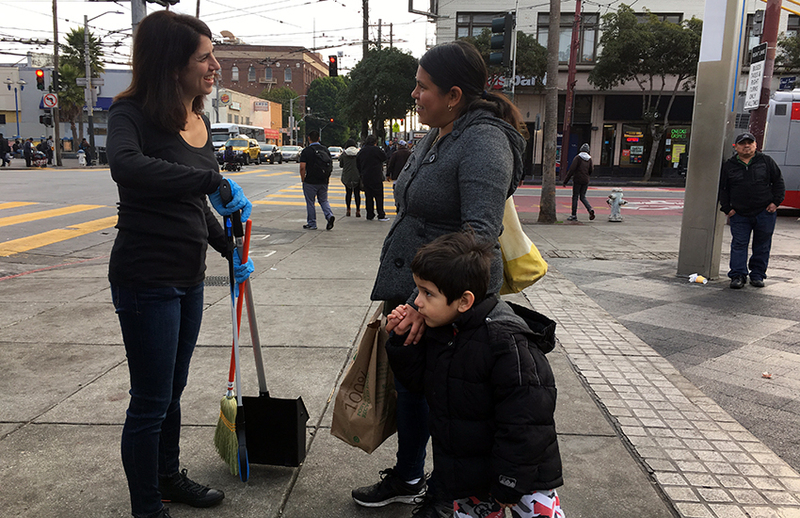 The residents of The Mission are consigned to wrapping burritos, janitorial work, speaking only Spanish and most importantly – obeying the orders of their cultural and political leaders. Funny thing though – I worked for a tech company in SF rooted out of El Paso with a Latino founder. Much beloved by his employees – a really smart and capable leader and technologist. Peru and Brazil are important outposts for logistics software. Cubans arriving in Miami go straight into tech cause – duh – it pays really well. Think folks originating south of the border can’t do tech? Think they can’t figure out how to use stackoverflow? Think it will take our minds off of scrubbing that toilet? Andrew – predigested food…sounds weird, but you’re just infringing on the prior art of birds. See you in court! Who is going to risk letting strangers in you home for $10? Airbnb hosts are getting ripped off. What business cannot find a coffee shop or hotel lobby to work out of? Pretty strange and unbelievable that this is a winning business plan.